During this time the team at AQUAHEAT have completed and maintained Worcester Bosch accreditations for Gas boilers. AQUAHEAT regularly sends its engineers on product training courses to ensure their knowledge remains current. As part of the selection process AQUAHEAT engineers completed Worcester Bosch product specific training courses to demonstrate competence on Worcester Bosch gas boilers. This course carries an industry recognised logic certification. To maintain their membership in the Worcester Accredited installer scheme AQUAHEAT must re-take this training every 5 years. The standard Worcester product guarantee period is usually 5 years. AQUAHEAT as accredited installers can offer longer guarantee periods ranging from 7 to 10 years depending on the boiler and parts installed. 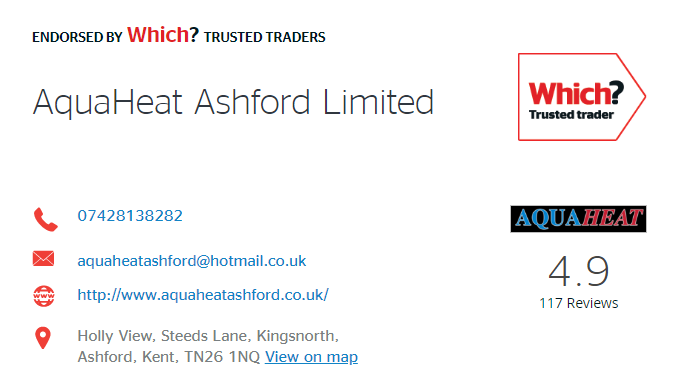 AQUAHEAT have been chosen by Which? to become a Which? trusted trader. Provide you with a clear breakdown of how much the jobwill cost before any commitment is made by you. We would really appreciate any feedback you have on theservice we provided. To submit a review please visit our company profile at which traders.co.uk.